For any individual that is currently seeking a party bus in Saline, then you should now feel safe knowing that your search has reached its conclusion. 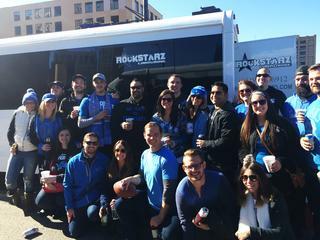 Here at Rockstarz Limousine and Party Bus, we have the experience you are seeking as well as specializing in providing out clients with the most amazing party experience that they have ever had. If you are looking to rent a party bus, then you will already have an idea of how many guests you would like to join you. However, it is often the case that a party bus limits the numbers quite considerably, but that is also why we have made the best use of the space possible to allow you to invite more people than ever before. Our Saline party bus rental option is also specifically designed to help you and your guests to feel as if you have ventured into your own private nightclub. As you cruise around the city, you will forget that you are actually on a bus as the experience that you will be having is out of this world. As soon as you all step on board, you will notice that the atmosphere we can generate on our party bus is unlike anything else. This is helped by the sound system and laser light display as we have looked at pushing the boat out to deliver on that atmosphere time and time again. Previously, individuals have looked at using our Saline party bus service for helping them to celebrate a range of occasions. This includes a birthday, anniversary, and even down to friends looking for a place to have a party that is different from the norm. If you live in the Saline area and are indeed looking for a party bus, then give us a call direct here at Rockstarz Limousine and Party Bus. The other option is to contact us via our website and someone will be in touch as soon as possible to discuss your requirements.